JACKSONVILLE, Fla. -- Kyle Reed is pounding the pavement once again, visiting businesses all over Jacksonville, Florida looking for work. "It's very hard. I've applied to over 10, 15 jobs," said Reed. The job search for the disabled Marine sergeant comes after he was sent back to square one this week. He says two weeks ago, he was finally hired by Red Lobster as a server. "After four months of being unemployed, to have an offer like this from Red Lobster, I was very excited, very motivated," said Reed. That motivation was dealt a surprising blow Tuesday. "I rolled up my sleeves like they asked me to, which is part of their server dress code, and they stopped me and said I don't know if you can work today," said Reed. 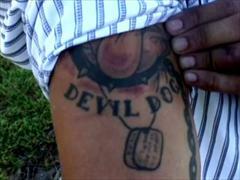 Reed was sent home after managers saw a Devil Dog and tag tattoo that stretches partly down his right arm symbolizing his years of service in the Marine Corps. "It's something that we kind of did together for our Marines that we lost," said Reed. Reed said he was told after being hired and days of working that visible tattoos are not allowed on servers. He said restaurant managers never told him that in the hiring process and the policy is not outlined in the employee handbook he received. "I'm sitting there pleading with these people saying I can cover this up, I can do this, anything to keep my job and they just turned me away," said Reed. Reed is honorably discharged from the Marines and no longer able to serve due to a disability. He's now back in school, and said he desperately needs a job to make a living. "They took it away. They took it away," said Reed. He's frustrated that he's having to start all over again. "I got very emotional. I'm just someone trying to make an honest living, trying to do the right thing," said Reed. He plans to fight for what he feels he deserves. "I still want my job that I earned and was told that I had, instead of having it taken away from me with no way of me grabbing it back," said Reed. Reed is now planning to go through a process called peer review, which means managers from different locations hear his story and make a decision about whether he should be employed at the restaurant. A manager at Reed's former employer referred questions to the restaurant's corporate office. Calls and e-mails to the office were not returned. According to Reed, managers said his tattoo wouldn't prevent him from working in the kitchen at the restaurant. Since none of those positions are open, they had to terminate him. Actress with Down syndrome returns to "Glee"